Former CIA and NSA Director Michael Hayden thinks America is just like Nazi Germany. He thinks it's outrageous that illegal aliens caught invading America are separated from their children the same as every other criminal in America is separated from their children when they go to prison. This man was the head of the NSA from 1999 to 2005 and the CIA head from 2006 to 2009. Under his leadership, the civil liberties of American citizens were decimated and a massive surveillance state was constructed. 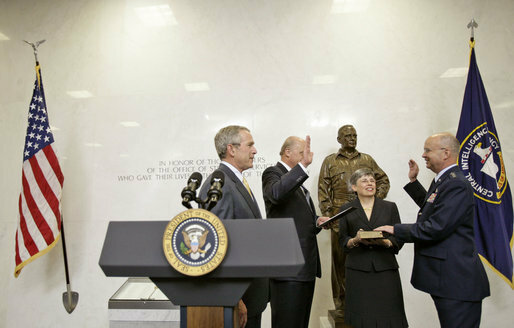 Hayden said "probable cause" is not in the Fourth Amendment and those who oppose torture are "interrogation deniers." He was fine with taking away law-abiding Americans' rights and freedoms -- which in his world is in no way authoritarian or comparable to Nazi Germany -- but he's not OK with illegal alien criminals being separated from their children while they're in prison for breaking the law. Paul Manafort has been separated from his children. Tommy Robinson has been separated from his children. 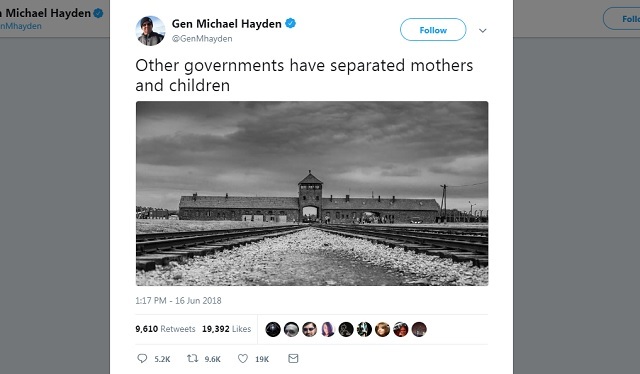 In Hayden's America, our borders would be wide open and American citizens who oppose globalism would be separated from their children and thrown in prison for being "Nazis."